One of my favorite foods arrives in mid-fall: cranberries! They are loaded with vitamin C, flavor and a host of ways to enjoy them. This relish is easy to prepare and abides as a staple in my November refrigerator. Sort through cranberries, discarding any soft ones. Cut a thin slice off each end of the orange and discard, then cut orange into large chunks. Do not peel! Cut apples into large chunks. 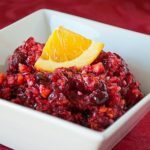 Place cranberries, orange and apples in food processor. Grind until finely chopped. Add walnuts, if using, and grind until diced. Transfer the mixture to a glass bowl and stir in sugar well. Cover and refrigerate for 24 hours to draw out and blend flavors. Serve with poultry, on a turkey sandwich, or in the delicious Book Lovers’ Cranberry Goat Cheese Bites appetizer. No matter how you enjoy it, you won’t be disappointed.